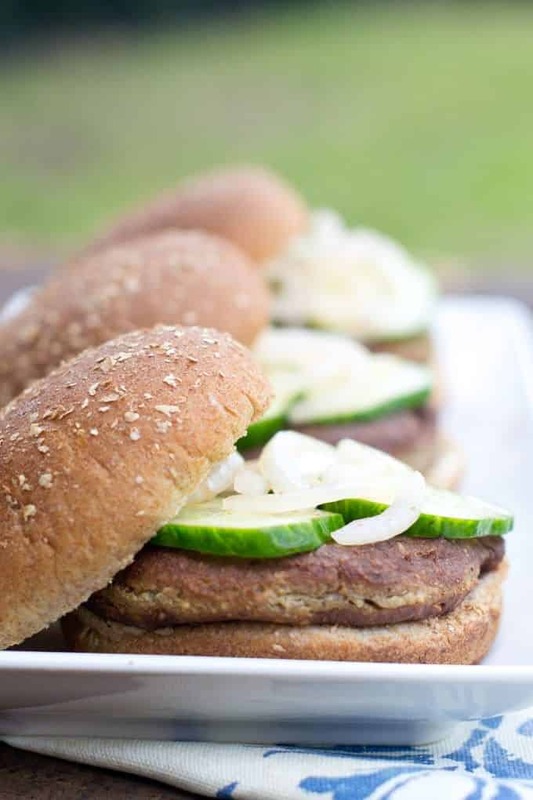 These homemade tofu burgers are spiced up with fun and tasty quick sriracha pickles. Our Vegetarian Burger Topic is brought to you by Produce for Kids, your healthy family resource for nutritious meals. Tofu burgers. The quintessential menu item offered to vegetarians at BBQ’s, restaurants, and cook-outs. It’s a nice gesture to give options, however from what I’ve seen, most places keep their tofu burgers in the back of the freezer next to the ice cream and the 5 pound bag of freezer burnt mixed vegetables. So when our editor-in-chief, Christine, suggested making a homemade tofu burger I was excited. Yes, this is bound to be better than those frozen things! But ummm…how does one make a tofu burger? The block of jiggly soybean paste stared up at me from its watery container. Deep breaths. It’s O.K.. You can do this. You can do this. I did some research and discovered that it’s not that difficult really. We tried a few different things and settled on our favorite. A tofu burger patty made with nuts and mushrooms in the food processor. It’s faster to put together than pre-heating your oven for those pesky frozen ones. This burger requires a two-step cooking process to ensure that everything is cooked through. Pan searing the patties adds a great crunch on the outside then they’re finished in the oven to cook through. The patties are pretty amazing, if I do say so myself. But what I love more is the kicked-up quick pickle that Christine made to top the burger. It adds crunch as well as so much flavor flavor. In food processor combine breadcrumbs, sunflower seeds, and cashews. Pulse until they are finely ground. Add in mushrooms, egg, Dijon, and Worcestershire sauce and blend together. Add in tofu, salt and pepper and pulse until everything comes together. Form into six patties. They will seem wet. Don't worry. They're going to hold together and be perfect. Heat a non-stick skillet over medium heat and add the oil. When hot add patties and cook until browned, about 2-4 minutes on each side. Transfer to baking sheet and cook in oven for 20 minutes. Meanwhile, in a small bowl combine the cucumber, onion, cider vinegar, Sriracha, salt, and sugar. Let sit for 20 minutes while patties are in the oven. 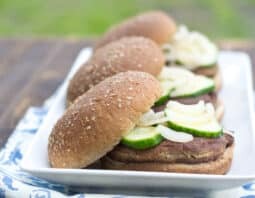 Remove the patties from the oven and place on hamburger bun. Drain veggies and put them on top of the patties. This post originally appeared in July, 2016 and was revised and republished in August, 2016.